Many of us have very frequently been in a situation wherein we are face to face with a particular issue that requires us to make a decision. Then, right after making a choice, you begin to question that decision. Was it the right thing to do? Perhaps things would have been better if you had made a different decision? The fear that you made the “wrong” decision can be quite overwhelming, and very harmful to your career. However, many people do not know how to remove this very common fear from their life—that’s what we are going to discuss how to do, scientifically. Before anything else, it is necessary to analyze the root of the problem, i.e. the reason that we feel remorse after making a decision. There are several possible reasons, but the major one is the “what if”. These dangerous two words tend to plague people after they have made a decision. They become obsessed with the possible outcomes that could have resulted from a different decision than the one that they chose, and hence they repeatedly imagine “what if” scenarios that may or may not have occurred if they had made a different choice. To tackle this issue, it is important to understand that not obtaining the specific outcome that you desired is not a good enough reason to second guess your decision. There is no guarantee whatsoever that you would have gotten that outcome from taking a different route—in fact, you might even have ended up worse off. So the very first thing you need to do is to nip the “what if” questions in the bud. Once you have done that, you need to take a moment to think about whether you considered all the factors that could aid you in making the best decision possible. One of these factors would be to take your time before deciding something—don’t be in a huge rush to get it over with. Instead, think it through rationally beforehand, but don’t dwell on it for much too long, either. Another factor would be to keep your emotions out of it. When it comes to professional issues, there is no place for emotions in decision-making. The most sensible choices are made by logic and facts, and while occasionally the use of intuition can be handy, feelings and personal bias should not be heavily relied on. Another important factor to consider before a decision is patterned from similar past situations. The results of certain choices tend to follow a specific pattern, and if you analyze the results of similar issues that occurred in the past, you will have a massive advantage. The next factor would be to make sure that all of the facts and data that you are relying on while making a decision are one hundred percent accurate and reliable. Once you have thought about whether you included all of these factors while making your choice, the next step is to prioritize your criteria. While it is a good idea to keep the advice of other people in mind, having a personal criterion in mind and giving it the utmost priority is what is most important. Your criteria should be based off of everything that you want to think about before making a decision, as well as the main goals that you wish to achieve from said decision. This brings us to the next step: figuring out how to align your decision with your goals, and what is important to you. This is where strategic alignment comes into play. Strategic alignment is a business process that aligns your business model and processes as well as your strategic goals and your company’s workings with your business’s core values. Good strategic alignment can make a big difference to the organizational workings of your company, whereas a lack of doing so is one of the major reasons why things go wrong and why people experience decision remorse. Strategic alignment is, hands down, one of the most important things you can do to eliminate decision remorse—because when you are confident that the choice that you made was in line with your goals and the values of your company, you will feel confident no matter what the results of that choice are. 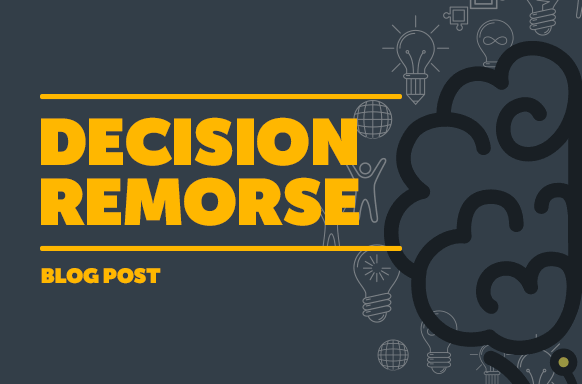 The very last step to eliminating decision remorse is one of the simplest ones, technically, but it is one that a lot of people find themselves unable to do—and that is to come to terms with the fact that there are, really, no “wrong” or “right” decisions. A lot of people define decisions as “right” when they obtain an outcome that they deem satisfactory and “wrong” when it is anything otherwise. However, it is important to note that many people, even after obtaining the outcome that they desired, still experience remorse or wonder if they should have gone about things differently. Everyone needs to accept the fact that a decision cannot be categorized as wrong or right simply by the outcome that it led to. In fact, the only way to define a decision as good is to ensure that it is in line with you and your company’s goals and values. It is for this very reason that two people that have made the same decision can feel either satisfied or unsatisfied—it all depends on whether they made sure that the choice was strategically aligned or not. With those simple steps, all professionals can fully and scientifically eliminate decision remorse from their lives for good.